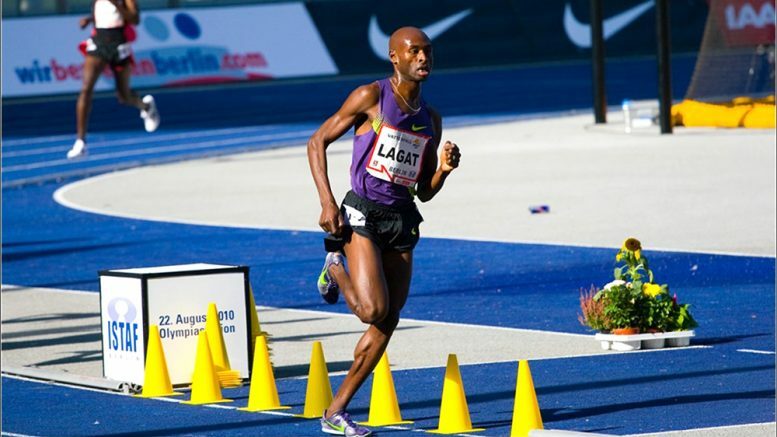 Bernard "Kip" Lagat, shown in 2010 Berlin race, is listed as M40 WR man but still doesn't hold the 1500/mile U.S. records. Masters track subcommittee reports have been posted in the USATF annual meeting Document Library. Interesting stuff. We learn, for example, that John Seto was paid $10,000 for maintaining top-25 USATF masters rankings (actually seasonal lists) at his amazing site. We also hear from USA Team Manager Phil Greenwald (I assume) about the Malaga relay issues. Following the meet, there has been discussion in various blogs and social media about the M65 to M80 teams in the 4×100 and the M65 and M70 in the 4X400. The M65/M70 selections were discussed with the people involved before the selections were submitted while the M75/M80 issue in the 4×100 was first raised after the meet. My opinion, and the opinion of the committee, is that our decisions were correct. Unfortunately, in making these types of decisions, one can’t please everybody. One major change was in communications, we made extensive use of WhatsApp to communicate – both from Team Staff to athletes in general and between athlete. We also posted the relay team selection information (starting with declarations received, then the runners and alternates for each team, and finally the splits) into a shared spreadsheet. Finally, the Notes and Reminders, previously posted on the Team Information board, was also a shared on-line document. My option was that the communications were quicker and more transparent. Some athletes missed the emails that contained the links, I shared the links when I became aware of this and I assume others received the links from their teammates. While, in an ideal situation, we would prefer to test every day at our National Championships and the specialized National Championships, we are limited by the amount of money allocated by the USATF to MTF for Drug Testing. Since we appear to be prohibited from charging a surcharge for Drug Testing, there appears, at this time, to be no alternative funding for this purpose. The lack of funding also prohibits, unless we allocate our existing budget to different events, testing at the Throws, Multi-event, and Region Championships. There have been numerous mis-understandings about Drug Testing. Some individuals have complained that he or she is being targeted. Simply stated, to the best of my knowledge, we haven’t specifically named any individual for testing. Others have professed a lack of knowledge about obtaining or re-activating a TUE and have requested my opinion or asked me to intervene in his or her behalf. I politely advise them that I am in no position to provide them with assistance. Others wonder if older athletes (+80) are being tested. Since they are in groups that are being tested, these older age group athletes are subject to random testing. In response to all the questions presented to me and other members of the Sub-committee, I will suggest that the Sub-committee prepare a questionnaire to be sent to all MTF athletes asking them to submit questions they may about drug testing and sanctions for testing positive. Upon receipt of responses from MTF athletes, these responses will be sent to USADA for answers to the questions resulting from responses to the questionnaire. I will then ask Amanda Scotti to publish the questions tendered and answers we may receive from USADA in National Masters News. If any MTF athlete has a specific question concerning Drug Testing at our competitions, please bring your question(s) to the attention of our Sub-committee. We will do our best to respond to your inquiry. Finally, I’m confused by Jeff Brower’s records report. Lemme know if you spot any other oddities. 6 Comments on "Revelations in masters reports: Pete Taylor comeback, $10,000 for John Seto, missing Lagat records"
If links above are broken. I’d like to know what masters rankings needs all this money for? I hope you’ll post a link here when you’re done with your site, Mr. Questions. A person with your command of the Internet would be a fool not to cash in on this opportunity! I, for one, am willing to use it if others pay for it. ANC, don’t be too critical. Mr Questions? may be a webmaster wizard and does stuff like the Masters web site while he is brushing though it is more likely, he has no clue what is involved in producing and constantly updating the web site. Will love to hear his response.